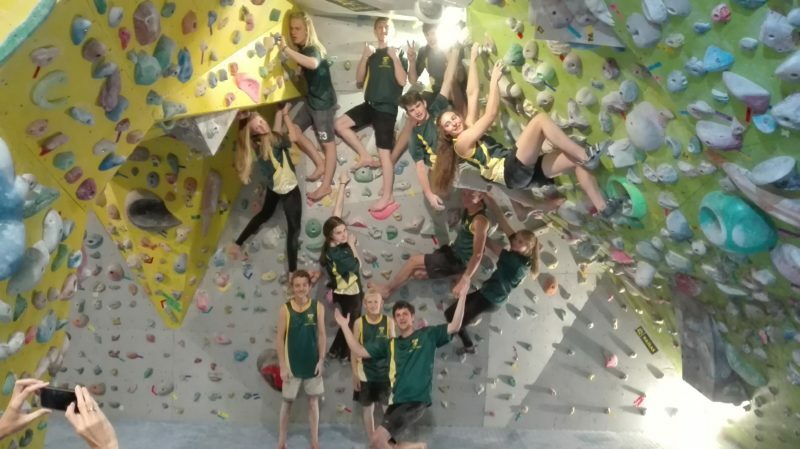 Our young SA climbing team has returned from a thrilling week (7-13 November) in Guangzhou, China competing in the IFSC (International Climbing Federation) World Youth Championships. We got the opportunity to catch up with James Barnes, who is the head coach and route setter at CityROCK Johannesburg. CityROCK: There are many excellent young climbers in South Africa, what is the selection process for the comp? James Barnes: The athletes are invited to a national selection competition which is held once a year. The routes in the selection comp are set very similarly to that of the World Cup grades. The Athletes are assessed by a group of coaches and officials. A comp like this helps us to determine who is able to get stronger in the time necessary in order to compete in the World Cup. The judges also need to decide which athletes need to wait till next year. CR: How many athletes were in our team and which age categories did they fall in? Male/female youth B are the under 15s. Male/female youth A are the under 17s. Junior male/female are the under 19s. We had 4 females and 2 males in youth B, 4 males in youth A and 1 male in the junior category. So 11 athletes in total. 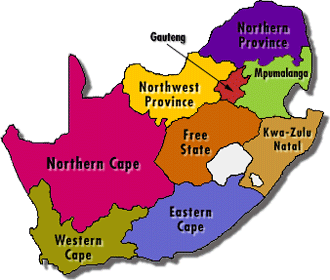 Our team members come from Gauteng, KZN and Western Province. CR: What did the training entail for our team? 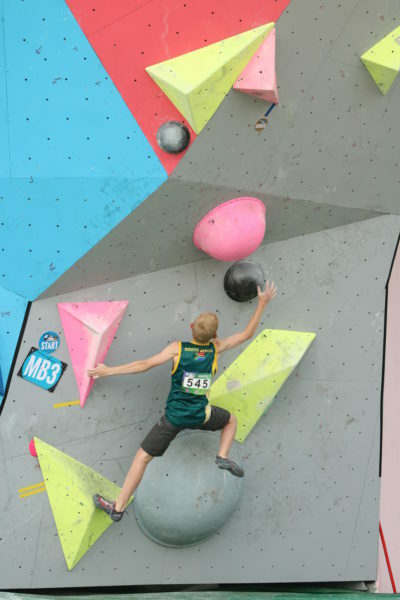 JB: SA took part in three disciplines – sport climbing, bouldering and speed climbing. With bouldering, the focus is purely on power, reading techniques and conserving energy. A boulder problem, especially of this standard is very taxing on the body so instead of trying a boulder 9 or 10 times, one needs to give it 4 or 5 official attempts in order to get the best out of every attempt. For sport climbing we focus mainly on endurance, finger strength and pump management. This entails trying difficult moves consecutively over longer climbing periods which can be anything from 40 up to 70 moves. We also took part in the speed climbing discipline in the Competition. We had no experience in speed climbing because we’ve never had a speed wall to practice on. CityROCK JHB has a new speed wall now that we’re back so we should do much better next year! CR: Who were the main competitors? 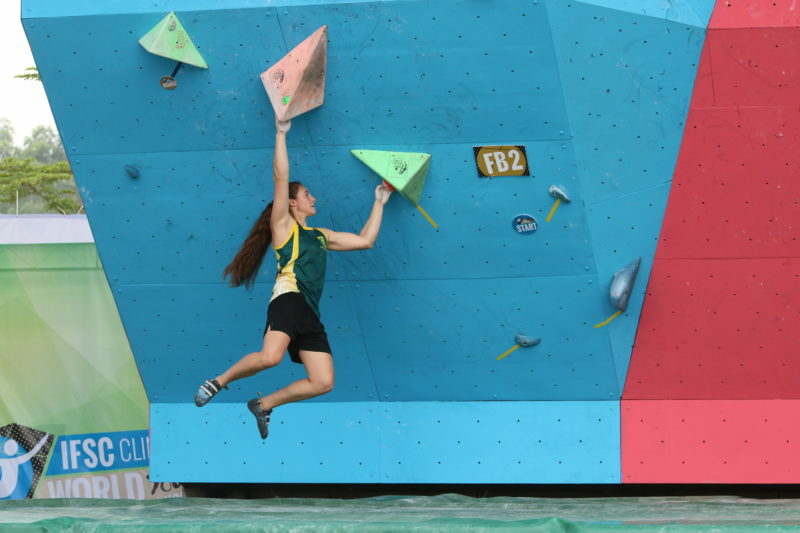 JB: This year some of the big names were Ashima Shiraishi (USA), Brooke Raboutou (USA), Kai Lightner (USA), Yuki Hada (Japan) and Simon Lourenzi (Belguim). JB: Our team had just done exceptionally well in our national comp after competing against the very best in the nation. At the World Champs they were placed into a completely different environment, an environment where their fellow competitors were doing warm ups that our team couldn’t even fathom doing. I’m talking hand stand push ups, which is pretty intimidating to see! The other participants from France, Sweden, USA, etc. compete internationally on a regular basis where our team only get the opportunity to go to World Champs once a year. The competitors get to know each other very well and are able to ascertain each other’s strengths and weaknesses which is a big advantage. The international teams are climbing grade 8B boulders and 36 sport climbs whereas our guys are still working on 8A boulders and climbing 30. So yes there was indeed a lot of pressure for our guys especially. However, with each year that goes by, we are gaining more and more information each year on how we need to train our kids physically and mentally in order to be ready for a competition of this standard. CR: What would you have done differently? JB: I would have spent a lot more time on mentally preparing the team, as all climbers know, it’s an incredibly mental sport so by focusing on the mental prep side, we’ll reap the benefits. Another big one is warming up, warming up will help prevent our athletes from feeling the debilitating nerves that come with such a big comp. Where they warm up prior to competing is also important, I would prefer to have our team warm up and prep in isolation so that they can focus on themselves rather than on the competition. CR: What were the highlights of the trip for you? JB: Most definitely the food! The Chinese know how to cook! I’m kind of kidding, highlight number one was getting the opportunity to see that even in a World Cup setting where the pressure is high and there is a lot at stake, the participants are all so warm and welcoming. Even though many of them are ranked top in the world, they were very humble and welcomed our team with open arms. The kids had loads of fun and played games together, that was fantastic to see. Another highlight was getting the opportunity to be involved in a world cup on the official side; seeing how its run, meeting the officials and organisers. I was able to speak to a lot of the different coaches from all over the world which gave me great insight on how we can improve our team. The coaches are willing to help grow the sport, the climber’s mentality runs true in all of them. Also meeting the route setters and talking to them about how they need to improve their setting each year was also a big highlight for me being a setter myself. Having the privilege to see my own kids who I’ve been coaching for so long, climb and see how they compete in a highly stressful environment but still perform well. They exceeded my expectations, also seeing what I have taught them being put into practice was very rewarding for me. CR: How do you keep the team motivated and positive? JB: It’s all about giving the athletes the benefit of the doubt. I am by nature an optimist and I truly believe in peoples’ abilities. If I see potential in someone who is doubting his/herself I will be there encouraging them and giving them the right advice and feedback in order to succeed. It was quite challenging at times due to the fact that I had never coached some of the athletes before. We had to build a lot of trust in a very small amount of time. Pep talks and feedback would happen on the planes and trains and whenever we got a chance to sit together. Encouraging each person in the team to believe in themselves (especially when they know who the competition is) plays a big role in how they perform. CR: Can you give aspiring competition climbers a few words of wisdom in how to succeed and take their climbing to the next level? JB: Consistency is key. If you are consistent with everything that you do, you’re going to get results. If you put in the right amount of time into training, rest and diet, you’re going to excel exponentially. Consistency is one thing that many people fail to stick to. They may be disciplined for about 3 – 4 weeks, then a cheat day comes along and this is where it all falls apart. A cheat day is fine, but that is what you need to accept, that it’s just a cheat day, time to move on and get straight back into it. Consistency is hard but it becomes easier once you turn it into habit. How to spot a climbing discipline by looking at the climber. Lead: The climbers’ build is lanky, toned and athletic. Boulder: Very strong, muscular build. Speed: A combination of lead climber and boulderer build. Strong, muscular legs with toned, lead climber arms. South Africa tied 32nd with 7 other countries. South Africa came 27th out of 39 countries. South Africa tied 27th with 7 other countries. Final words from JB: A special thank you to SANCF for organising this amazing opportunity for the youth team and all the officials. The management of the team worked really hard to make sure that everything was catered for and ran smoothly. Thank you to David Greaves and Gina Amorim for sponsorship and all the youth team parents and SANCF management for their continued support.